If you've purchased a teacup, micro, miniature or other diminutive name for a potbellied pig, realize that these are simply marketing terms. Pretty soon, that adorable little creature will grow, probably ending up between 50 and 150 pounds. That's comparable to a medium-sized to large dog, although it's small for a pig -- commercial hogs can weigh 600 to 800 pounds. Annual vaccinations and good care avoids many health problems in your pet. There's a reason "eats like a pig" is a pejorative term. Pigs love to eat, with potbellied pigs no exception. Not only does obesity cause health issues in the animal, but fat pigs are more prone to heat stress if left outdoors or in homes that aren't air-conditioned in hot weather. 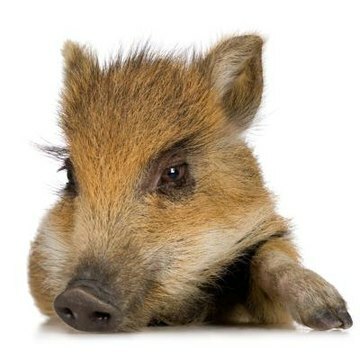 Feed your pet a diet specifically formulated for miniature pigs, not commercial hogs. Occasional fruit or veggie treats are fine, but don't overdo it. Also, take care not to go the opposite route and underfeed your pig to keep him small. Many so-called "teacup" pigs are actually starved. Ask your vet for recommendations for a feeding plan for your pig. Miniature pigs are prone to respiratory and nasal infections. Among the most common pet pig health problems is atrophic rhinitis, a nasal passage infection. Affected pigs experience nasal discharge, or a constant runny nose. Severely affected animals might discharge blood from the nose and suffer from permanent nasal deformities. The condition is generally prevented by regular vaccination against the organisms responsible for the condition. Pneumonia also strikes teacup pigs. If your pig starts coughing, appears lethargic and spikes a fever, immediate veterinary attention is necessary. Older pigs might experience arthritis, or joint degeneration. That's another reason to keep your pet at an appropriate weight, as there's less stress on the joints. If your pig shows signs of lameness, contact your vet. She can prescribe medication to address the pain and inflammation. Constipation often affects pigs, so keep an eye on your pet's excretory output and watch for signs that he's straining to defecate. Constipation might result from a pig not drinking enough water, but it also is caused by the animal eating foreign objects. Your pig should always have water available; if he's not drinking sufficiently, try flavoring his water with juice. If his water consumption is normal and he's still straining, take him to the vet. Prolonged straining can lead to rectal prolapse, which requires surgical correction. Foreign objects might also require surgical removal. Potbellied pigs might experience cystitis, or bladder infection, as well as stones in the bladder. If your pet strains to urinate and appears in pain, a prompt vet visit is in order. While your vet can prescribe antibiotics for cystitis, stones might require emergency surgery if your pig's urethra is blocked and he can't pee. All sort of skin problems affect potbellied pigs. Those left outdoors in the hot sun may experience sunburn. The Merck Manual for Pet Health notes that dry, itchy skin is seen in virtually all pet pigs at some point. You can use mild moisturizing lotions to help alleviate the dryness. Since melanoma also occurs in pigs, take your pet to the vet if you notice any growths.